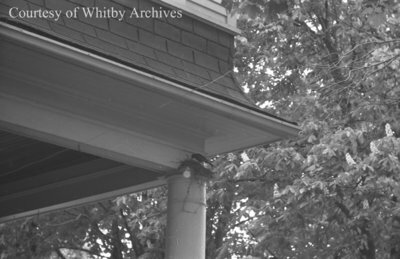 A black and white negative of a bird's nest on top of a pillar at 501 Byron Street South in Whitby, Ontario. This house was built in 1915 and purchased by Judge Robert Ruddy in 1919. It was owned by the Ruddy family until 1993. Marjorie Ruddy, prominent Whitby photographer and daughter of Judge Ruddy, grew up in this house. Bird's Nest, May 24, 1938, Marjorie Ruddy. Whitby Archives A2013_040_788D.